Have you been tasked with finding and comparing different backup solutions, only to become overwhelmed with various options, an avalanche of features, and abundant licensing models from the very start? If you’re looking for a backup solution, this post will hopefully give you some insight and help you steer clear of the potential pricing pitfalls. For most companies, one of the major reasons they simply purchase backup software is that they can leverage their existing hardware. What they often overlook, though, is the software license fees associated with the total cost of ownership. In most VM backup cases, vendors typically take different approaches to how they charge you, either per CPU socket or per VM host (system). Depending on your setup, a per host charge might not always be more expensive than per socket. For example, if you’re running services on a 2-socket VMware server at US$500 per socket, that’s going to cost you more than a charge of US$800 for just the host itself. When comparing vender pricing, be sure that you’re considering the total cost and not just the initial price tag. The table below shows how licensing models work in different use cases. Aside from licensing fees, don’t forget to add maintenance renewal costs for software updates, patches, and technical support. Do you know the cost of annual support renewals can account for 22% to 27% of the perpetual license cost? 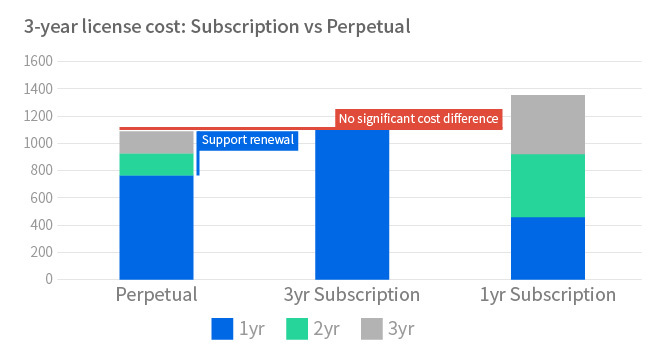 As the graph below shows, if we compare 3-year total cost on backup software, there’s almost NO cost difference between perpetual & subscription licenses after counting in support renewal costs. When it comes to software management, since the integration of software and hardware involves two different companies with different support systems, businesses need to look at the software and hardware separately to figure out the root cause when a problem arises. If you don’t have your own professional IT team, you’ll probably have to reach out to different vendors, going back and forth to narrow down the problem, which often leads to wasted time and effort in the end. The last thing to keep in mind is something we often neglect – the cost of hardware. Many businesses are limited by their budget, so they usually opt for freemium software. However, we all know there’s no such thing as a free lunch, and freemiums usually come with their own feature limitations, the major drawback of which would be to perform a FULL backup every time. Take a simple scenario as an example – if you want to keep daily backups for 7 days, and the data size is 1TB with the average daily change rate at 5%, you’ll find incremental backups will save 80% on storage. By contrast, it’s very likely you’d waste over 6x more space at the destination server compared with freemium software. Make sure you also include the cost of hard drives and server hardware, especially when you want to back up more complex business workloads. How about a backup solution that can help you minimize all possible hidden costs? We compared the license fees from other backup vendors with similar feature sets. 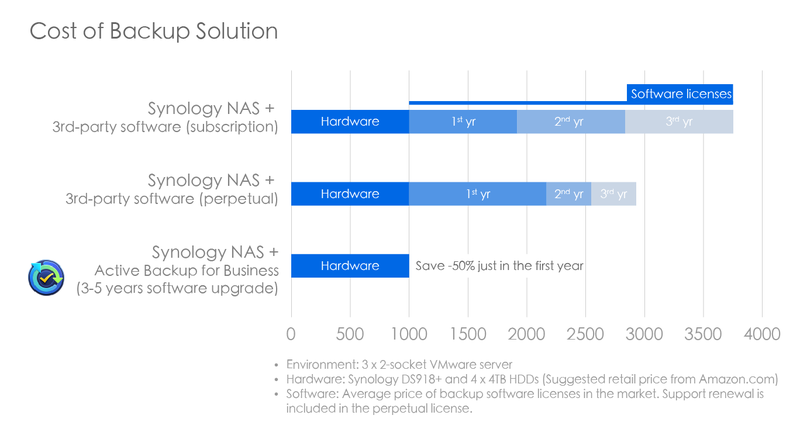 In just the first year alone, Synology Active Backup solution saves you more than 50%. The cost savings can be even more significant when you compare Dell EMC or HPE as backup storage servers, or when you need to back up larger business workloads. In short, with the money you pay for a backup software license (no matter if it’s subscription-based or perpetual) for the first year, you can actually get a Synology NAS while protecting business workloads on virtual machines, physical servers, Office 365, and G Suite – both accessible with a price roughly the same or even less than the 1st year license fee. You can further improve storage efficiency with global deduplication, which prevents redundant data when backing up from multiple devices. For example, SHISEIDO Taiwan saved 54% (28TB out of the total 58TB) storage usage with global deduplication in its business environment. Without this technology, it could have cost approximately $1500 to store the extra 30TB of data on hard drives and expansion units. The table below shows how Synology Active Backup for Business compares with other backup solutions (freemium or premium licensed software). Besides the cost advantages, Active Backup also integrates plenty of features you can find in modern backup software, allowing you to manage backup tasks from one simple console and assure you of fast and reliable recovery. Want to know more? Watch the video here.